We specialize in designing and manufacturing varieties of phone cases and card stickers with high quality and competitive price. What's more, we offering 30 days money back and 1 year warranty from manufacturer. Wallet Design: 2 card slots to hold your cards or few cash, make you can easily go out without carrying any bags or anything like that. 3M Adhesive Sticker: Stick on your phone firmly, It won't lose strength due to pocket heat, light moisture or sweat, and it won't leave a sticky residue if you choose to move it. Universally Fit: Perfectly fit most phone models like iPhone X, 8, 8 Plus, 7, 7 Plus, 6, 6 Plus, 6s, 6s Plus, Samsung Galaxy S8, S8 Plus, S7 Edge S6, S5, S4, Note 8, Note 5, Note 4,HUAWEI P8 P9 P10 Lite and such on. Convenient to use in any occasion. Note: If you have any problem about our products, please contact with us at anytime, we will friendly answer for you! [Quick&Convenient] Stick it to your phone case or the back of your phone, store up to 3-4 card holders, will carry few cash, debit cards, credit cards, ID cards or some money while going out. 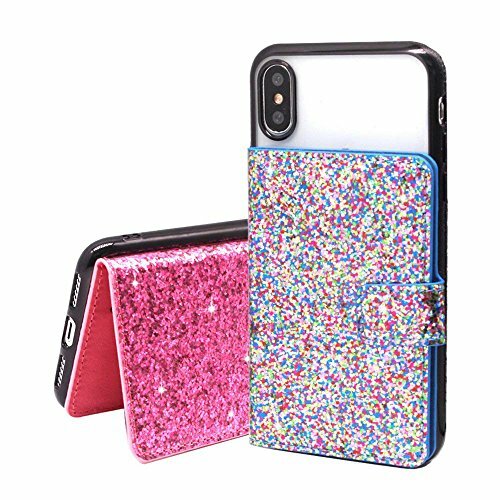 [Slim&Sequins Glitter Design] It's so thin and compact, it won't add bulk or make your phone harder to carry even when in a front pocket, purse or handbag; Made from quality sequins leather, give you a comfortable touch, glitter elements on the case would not come off when you touch, the surface is smooth. [Tight&Protective] Magnetic front closure can hold all the cards or cash firmly and prevent the contents from falling, even when the pocket is upside down! The card holder features durable leather, ensures the pocket will keep in shape after long term use. [Safe 3M Adhesive] Each stick on wallet uses 3M adhesive tape, strong,firmly, long-lasting hold. It won't lose strength due to pocket heat, light moisture or sweat, and it won't leave a sticky residue if you choose to move it. [Stand Function&Universal Compatibility] Can be used as stand for better viewing angle; ClarksZone flip card holder can stick on most smartphones (Like Apple, Samsung, Huawei, Google devices )or phone case accessories or smooth flat surface. If you have any questions about this product by ClarksZone, contact us by completing and submitting the form below. If you are looking for a specif part number, please include it with your message.